NO DIVE NO LIFE ! Where's Candidasa? Such questions are still often asked, and that may show the depth of Bali. Though there are getting more restaurants and hotels in Candidasa now, a little bit before, here were just local fisherman villages and small towns where Jukungs(local catamaran yachts) were coming and going fluttering vivid sails. And right now, people who grew weary of the crowd in Kuta, Sanur, etc are gradually getting to live here, and with beautiful coral along the Amuk Bay, Candidasa is spreading as the most prosperous tourist resort in the east. Some people who know only Candidasa of 10 years ago should be so surprised with its big change now. And others who come from Kuta, Nusa Dua, Sanur etc to Candidasa may also be surprised with the calmness and relaxing mood here. Candidasa still keeps un-sophistication in old times, but also has restaurants, bungalows, money changers, transport, and salons necessary for your mostly comfortable stay. Here is a resort to relax . When you feel this atmosphere, you can understand why a lot of people have long stay here. In addition, as for diving, here is the best location in Bali; off the coast of Candidasa, Tepekong and Mimpang islands are front, and Nusa Penida and Lembongan islands are more offshore, and every dive sites in Padang bai is along the same Amuk bay. 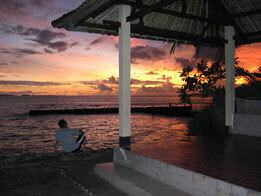 Further, it takes only 1 hour by car from here to popular sites such as Tulamben or Amed. Therefore, in Candidasa, you can relax in the morning, even though you go diving, and also can read books in a pool side or do anything after enjoying diving. We believe that this is the way to enjoy yourself in Candidasa. In addition, it takes only 5 minutes by car to Tenganan village that is world famous for Double-ikat(Gringsing) and baskets, and you can go around in one day from Candidasa to an art village, Ubud, Pura Besakih, and Kintamani of scenic beauty. At last, Candidasa's not vulgarized? yet, so low prices and much less hawkers compared with Kuta etc, are some of characteristics here. Candidasa is for divers, and also the relaxed and the active. Pure nature and people are waiting for your visit calmly here.